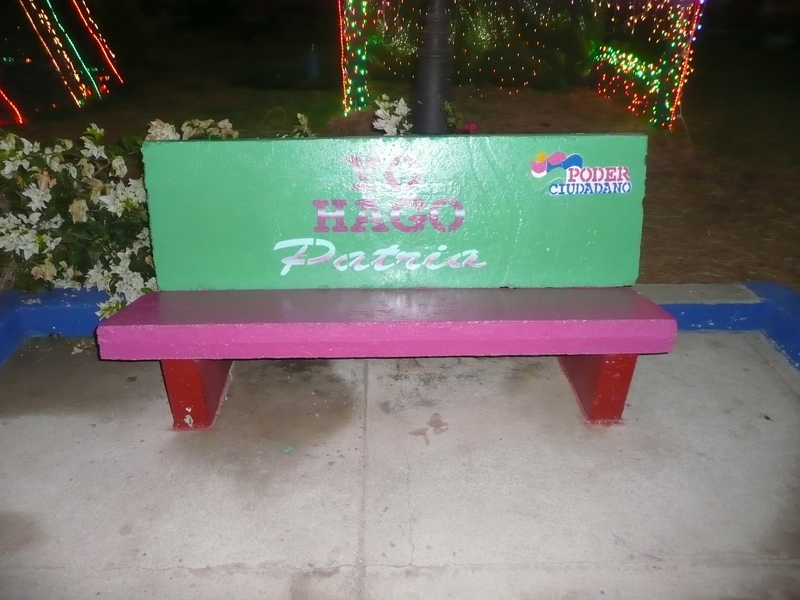 I first visited Nicaragua on a solidarity brigade in support of the revolution and the FSLN, just after Daniel Ortega and the Sandinistas had lost the elections to Violeta Barrios de Chamorro in 1990. Like many people around the world, in the 1980s I was inspired by Nicaragua’s revolutionary struggle against Somocismo and US imperialism and by the political possibilities that the Nicaraguan Revolution enabled us to imagine. It turned out to be a long-term commitment. 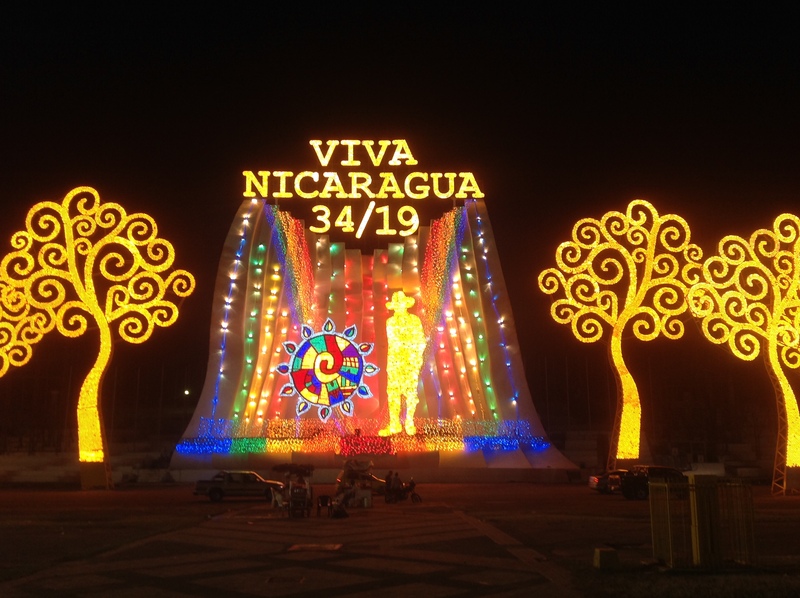 For the next twenty years, I came back to Nicaragua many times to do research. I loved working here for many reasons, but mainly because Nicaragua was a country that had had a revolution, and that collective historical experience made Nicaragua an intellectually stimulating and emotionally moving place to work. I’ve been here for the past month doing fieldwork, my first visit since 2009. Today, politically speaking, Nicaragua is a bizarre and frustrating place. Daniel Ortega and the FSLN have been back in power since 2006, but within the government currently in power there is nothing left of that inspirational revolution. Since 2012, centre right newspaper La Prensa repeatedly refers to Ortega as ‘el presidente inconstitucional’ because he was re-elected in 2011, in spite of the fact that the Nicaraguan Constitution did not permit re-election. In the early 1980s, Sandinista Nicaragua aspired to be a participatory democracy. The National Assembly passed constitutional reforms this week that not only do nothing to strengthen participatory democracy, but weaken and undermine representative democracy. The reforms have several dimensions to them, but essentially they allow for indefinite re-election, which means that the current president (who has now spent a total of 18 years, 1979-1990 and 2006 to date as president) can continue to be president for ever. The reforms also eliminate the threshold required to be elected and therefore the second round of voting. An inadequate and restrictive electoral law has just become more inadequate and more restrictive. In 1990, the Sandinista defeat was totally unexpected, but it was clear that the Sandinista leadership had made a lot of serious mistakes during their time in power. Tens of thousands of people, many of them still teenagers, had died on both slides of the conflict and daily social reproduction in the face of chronic shortages and hyperinflation was tremendously difficult. Economic and emotional exhaustion generated by the war, the military draft and the US trade embargo had clearly contributed to the electoral defeat but they were compounded by FSLN verticalism and abuses of power. Internal and external critics were calling for greater internal democracy and better engagement with ordinary people. The party needed to appoint new leaders, new faces. But they didn’t do that, instead they purged the party of dissidents, many of whom were prominent Sandinistas, pushing people with integrity and political experience, people who had made enormous sacrifices to create a better world, into civil society organizations, NGOs and into a rival Sandinista party, the MRS. And throughout all this time, Daniel has clung onto power, fighting off any challenges to his leadership and refusing to pay attention to any criticism. At the end of the 1990s, the FSLN did dodgy deals with the liberals to make it electorally possible for them to return to power. I was here in 2006 when the FSLN returned to power after 16 years in opposition, winning the elections with fewer votes than they had lost with in 2001. There were serious concerns about the integrity of that election, many people were disenfranchised for example as they had been unable to receive their cédulas or voter identity documents in time. Despite these worrying trends, I still felt quite optimistic about the state of democratization in Nicaragua at that time (see Cupples 2009). I no longer feel that sense of optimism although Nicaragua triumphed over Somoza and a brutal National Guard against the odds and can probably do so again. Since 2007, the Nicaraguan government has received millions of dollars in aid from Venezuela, a flow of petrodollars that is now coming to an end, given the death of Hugo Chávez and the severe economic crisis in Venezuela. This money has been partially privatized through a bi-national company, ALBANISA, which keeps it out of the national budget (for a good overview of ALBANISA, see Riley 2010). Many low-income Nicaraguans feel the government is more present and responsive to their needs. The neoliberal governments that were in power from 1990 to 2006 were truly horrible, depriving people of economic opportunities and hope. The current FSLN is however a party of image rather than substance, indulging in a clientelistic, paternalistic, and authoritarian populism. They promised a new oil Venezuelan refinery that would bring jobs, and Chávez even came to lay down the first brick. Beyond that first brick, it has never materialized. 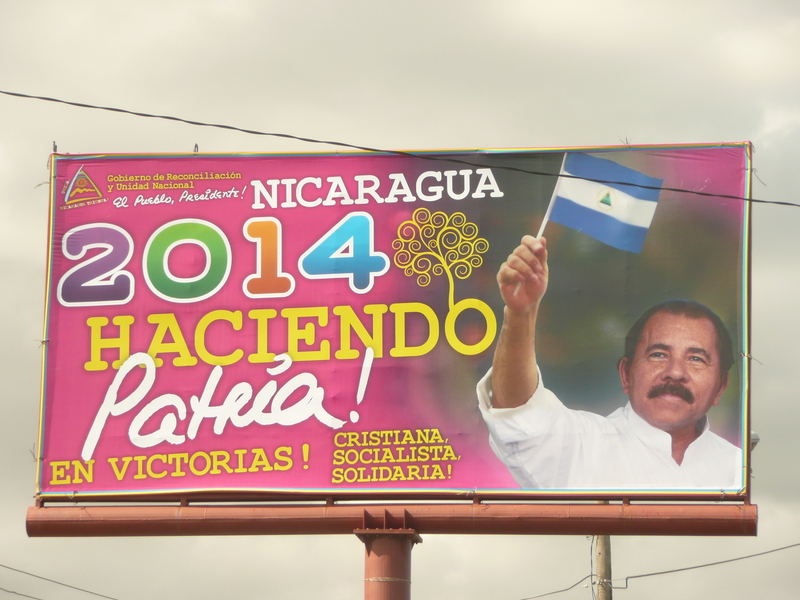 The current FSLN leadership describes Nicaragua as ‘cristiana, socialista, solidaria’, – Christian, socialist and in solidarity, it talks about ‘vivir bonito’ or living nicely and Daniel’s face is all over billboards along the highways, as if we were in the middle of an election campaign. The latest ones announce that in 2014 the government will be “haciendo patria” or making the nation whatever that means (see Figure 1). This past week, the president sacked the head of the Nicaraguan Central Bank without saying why, and the vice-minister of education. The police also opened fire on a group of protestors in Chichigalpa and Juan de Dios Cortés, a 48 year old man was killed. 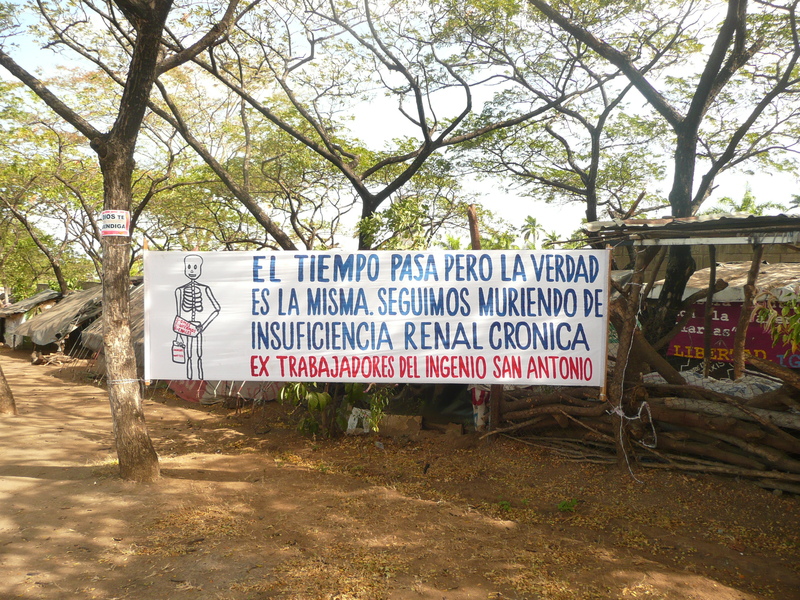 The protestors are workers of the Ingenio San Antonio which produces the sugar for Nicaragua’s famous Flor de Caña rum who are suffering from kidney failure as a result of the pesticides to which they have been exposed. Thousands of them have already died (see Figure 2). The Ingenio is owned by one of Nicaragua’s wealthiest capitalist families, the Pellas. There has been no official government response to the plight of these workers. In an article in Spanish newspaper El País, Nicaraguan journalist Carlos Salinas Maldonado (2014) recently asked Comandante Ortega why he remains silent. Salinas wonders why Daniel as a self-professed Christian and socialist is not speaking out in favour of workers harmed, exploited and seriously unwell as a result of ‘savage capitalism’. Given just how much Venezuelan aid has flowed into Nicaragua, things really should be a lot better for ordinary people. But in this ‘Christian and socialist’ country, there are still children begging at the traffic lights in the capital. Half of the population still lives below the poverty line. There are high levels of urban insecurity. A few days ago, I was in a store while the two women in the clothing boutique next door were held at gunpoint and forced to hand over their cell phones and the day’s takings. Wherever there is affluence, there is privatized armed security, so that the rich can be protected from the poor. Managua remains a city built for cars. It is virtually impossible to walk around Managua because of heavy traffic, roads that are almost impossible to get across and the risk of being mugged. But getting a taxi isn’t necessarily a safer option, because taxis routinely take additional passengers, and then you run the (admittedly small but terrifying) risk of the driver picking up an accomplice and being hijacked. Despite the urgent need for some urban planning (regulation of the taxi industry, some decent footpaths and some more pedestrian crossings would be an excellent start), instead the government has invested in large amounts of decorative lights. There are Christmas lights in central Managua, lots and lots of them. Although the time for Christmas lights has now passed in most of the world, much of the city in early February is still ablaze with electric Christmas trees, angels and reindeers. The government has also created large permanent electrified metallic structures called “árboles de la vida” or “trees of life”, estimated to cost US$20,000 each. They stand tall over much of Managua but they are concentred in particular along the Avenida Simón Bolívar. 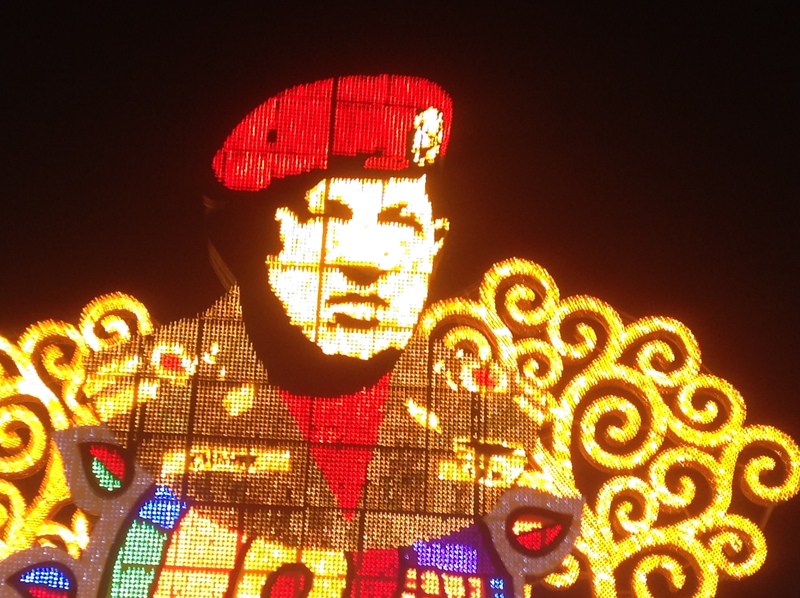 There is also a large electrified tribute to Hugo Chávez here too (see Figures 3 and 4). When I arrived in early January, there were also lots of state-sponsored nativity scenes – not just a few but lots and lots and lots. It is a very strange use of public money in a country with so much poverty. Especially as there are communities in the eastern part of the country that still don’t have electricity in their homes. People who do have electricity struggle to pay the bills. Not far from here is the redeveloped Puerto de Salvador Allende or El Malecón on the edge of the lake. This is one clear visible improvement to the urban landscape. There are new bars and restaurants but there are also picnic tables and playgrounds for kids. It’s a nice place in the central city where you can go whether or not you have money to spend (although there is an entry fee if you go in by car). 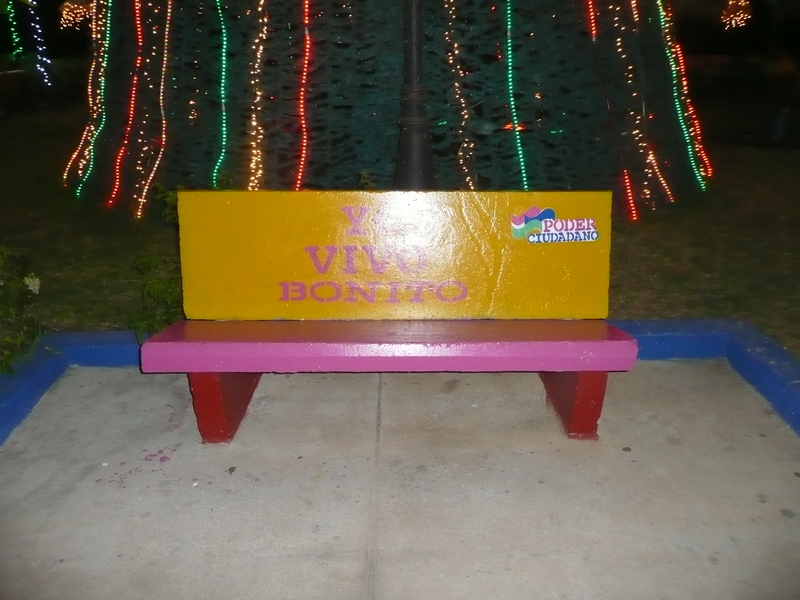 But the Sandinista hyperreality is here too, the brightly coloured painted benches announce things like “Yo vivo bonito” “I live nice” or “Yo hago patria” “I make nation” (see Figures 5 and 6). Of course, Nicaragua’s most important hyperreality is the imminent or possibly not so imminent interoceanic canal. The government has awarded a 50 year concession to Chinese company, Jing Wang, to build a canal across Nicaragua which would rival the Panama Canal. If built, the project promises to create economic growth and half a million jobs. But there are huge concerns about the project. There is no publicly available environmental impact assessment and there are justifiable fears that such a project would devastate Nicaragua’s environment and natural beauty, its forests, flora and fauna, and could seriously pollute or drain the beautiful Lake Cocibolca, the largest freshwater lake in Central America, of water. While many Nicaraguans are concerned, many others are not because they don’t believe it will ever be built. Control of the media has been central to the Sandinista strategy of simulating a prosperous nation. Sadly, critical and independent media are shrinking in Nicaragua. Most of the country’s radio stations, television channels and newspapers are either owned by the government, owned by the family of Daniel Ortega, or owned by business interests that have no interest in criticizing the government and probably benefit because they don’t. The government is able to starve those that remain of state advertising as well as of some private advertising. In an age of media convergence and media democratization however, the attempt to control the political economy of the media will only get so far. El Nuevo Diario has been purchased by Ban-Pro so has lost its critical edge but La Prensa remains a critical if conservative source of news. For the minority of Nicaraguans that have access to the Internet, the critical voices of opposition to Orteguismo are very loud, both in online journalism and in social media, especially Twitter. Here people repeatedly say that Nicaragua is becoming a dictatorship and note the many similarities between Somocismo and Orteguismo. There are many differences of course, there are no political prisoners, assassinations or people being forced in exile like there were under Somoza. There is no state-sponspored torture. But for León Nuñez (2014), dictatorship is when legislative, judicial and electoral power is subject to the will of the ruler, there can be dictatorship “without killing, imprisoning or sending people into exile”. The FSLN knows that if it did go down that route, it would all be over for them very quickly. Hence the investments in creating a hyperreality through officialized media, billboards, painted benches and urban electrification. In other words, if you keep telling people how much progress the country is making, and if you see pretty lights all over the capital, maybe they will start to believe it, even if everyday life continues to be characterized by multiple forms of precarity. Of course, in Gramscian terms, the people’s good sense can never be extinguished by the hyperreal and manufactured common sense. The government knows that people are organizing, the opposition is becoming more coherent, even though how it will change is not all clear at this stage. What is clear is that Nicaragua and Nicaraguans deserve something so much better than this.